Be the first to share your favorite memory, photo or story of LaVerne . This memorial page is dedicated for family, friends and future generations to celebrate the life of their loved one. 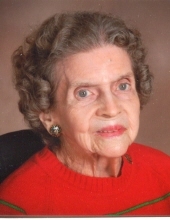 LaVerne D. Purkey, 96, of Bloomington, passed into the hands of the Lord on Wednesday February 6, 2019 at 6:00 am at the Martin Health Center, Bloomington. She was born May 8, 1922, the daughter of William & Alvina (Jacobs) Sieg of Bloomington who both preceded her in death. LaVerne married the late Lt. Roland A. Purkey January 1942. She is survived by one son, Ronald W, daughter-in-law Mary both of Normal and a grandson, Ronald M. of Naples, Florida. Her sister, Elverta Sieg preceded her in death as well as an infant brother, Delmar. LaVerne was employed by State Farm for six years and retired from Country Companies after 25 ½ years of service. She was a member of both State Farm and Country Companies bowling leagues and the IAA golf league. LaVerne was a life long member of Trinity Lutheran Church and served on the Altar Guild. Funeral Services will be at 11:00 am Monday February 11th at Trinity Lutheran Church, Bloomington, followed by a graveside committal service at East Lawn Memorial Gardens. Visitation will be from 10:00 – 11:00 am at the church on Monday. Calvert & Metzler Memorial Home, Bloomington is in charge of arrangements. In lieu of flowers, memorials may be made to Trinity Lutheran Church. The family wishes to thank the staff of Westminister Village, Martin Health Center and in particular Sarah and Marilyn from Advocate Hospice for the excellent care she received. "Email Address" would like to share the life celebration of LaVerne D. Purkey. Click on the "link" to go to share a favorite memory or leave a condolence message for the family.